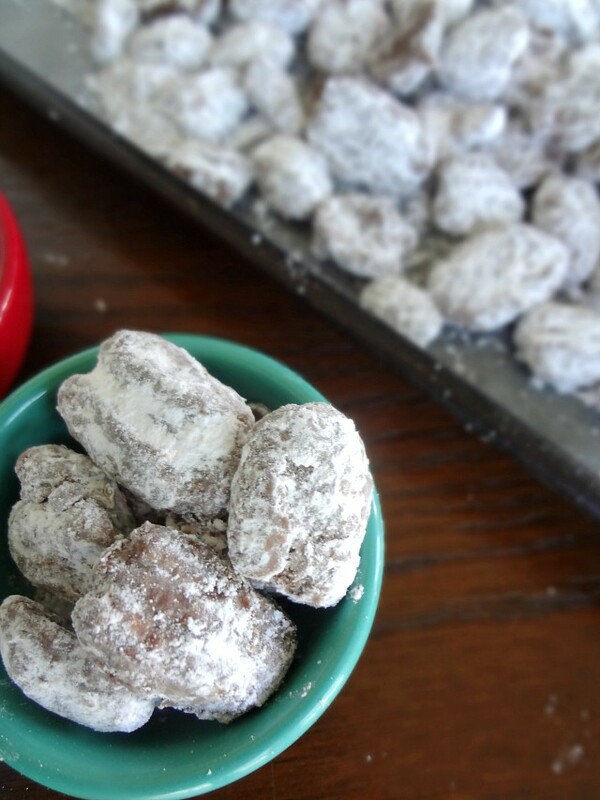 Muddy Buddies or Puppy Chow--whatever you call it, it's delicious (for those who don't know: it's chex cereal coated in a butter/chocolate/pb mixture and then tossed in powdered sugar). And I don't know why I had never even thought about using the same method to coat something other than chex. 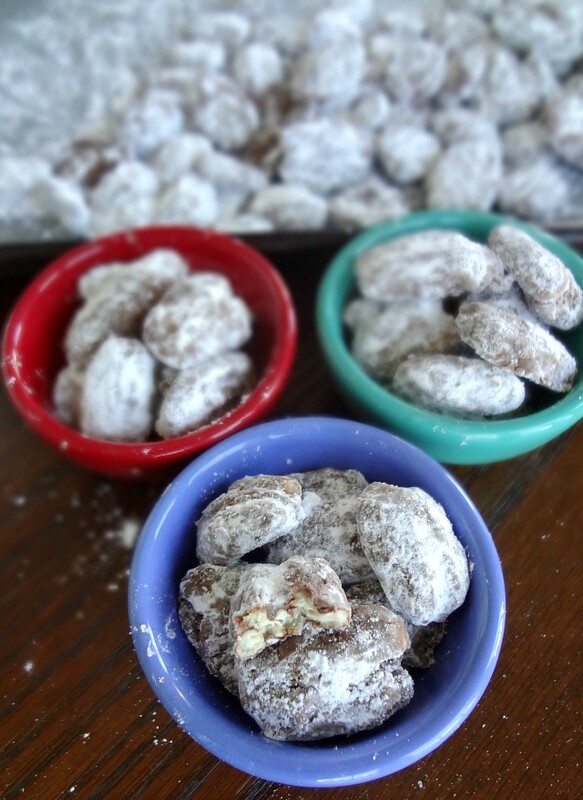 But when I saw this recipe using toasted pecans...oh my goodness I knew I had to make it happen. Plus...it's stupid easy. Which is necessary in the unpredictable life of being a new(ish) mama. I actually sort of am enjoying baking/making desserts with James now. I'll put him in a baby wrap and he likes to face outward and then chew on one of his baby spoons or something while I make stuff (and sometimes he tries to "help"). I think the kitchen and me making stuff in the kitchen is just super new and interesting for him and it's sort of adorable and warms my heart. Plus it means I get to have treats. So it's a win all around. 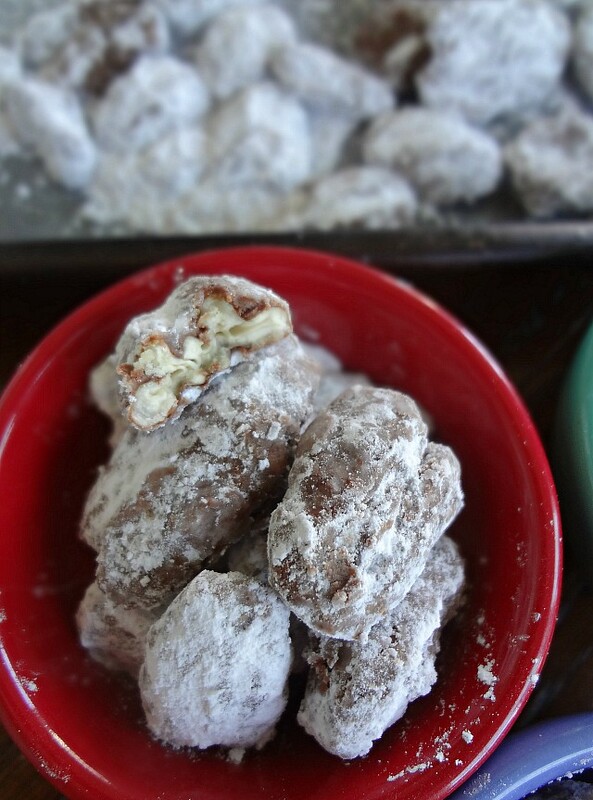 Speaking of wins, these pecan muddy buddies definitely are one. I think I still prefer classic puppy chow but I liked the nuttiness of these-and Michael was a BIG fan. He couldn't get enough. He may have even eaten more of them than me! Which is sort of a big deal. To toast the pecans (optional if you like raw pecans, are using pre-toasted pecans, or to make this no bake)-Preheat oven to 350F degrees. Place pecans on a baking sheet and bake for a few minutes, stirring every minute, until lightly toasted-if you can smell them, they're done. Be vigilant to keep them from burning, it can happen fast! Immediately pour into large bowl to cool. Place chocolate chips, peanut butter, and butter in a microwave safe bowl and microwave on high, stirring after 30 second increments, until melted and smooth. Pour chocolate mixture over toasted pecans. 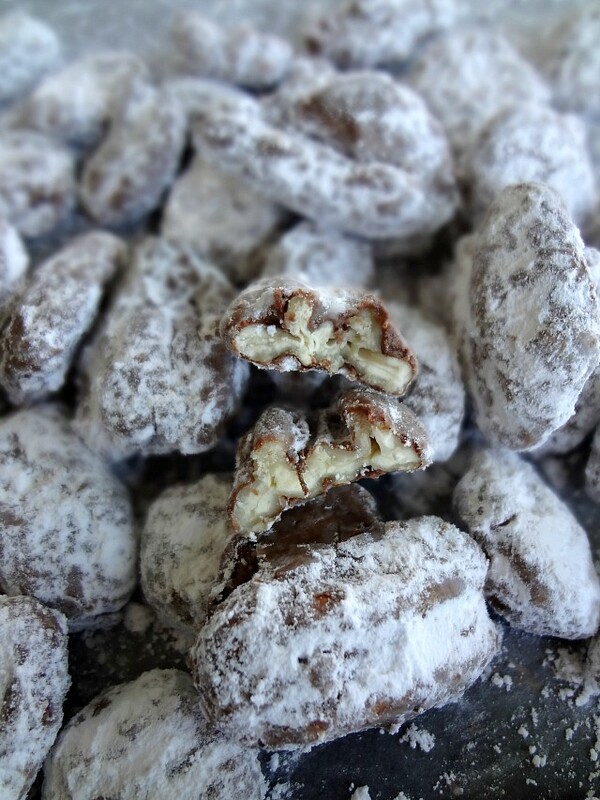 Place 1 cup powdered sugar in a large bag. Pour in pecans and close up the top tightly before shaking to coat. Pour onto a parchment or wax paper lined baking sheet to cool. Store in an airtight container or ziptop bag for up to 5 days. Seriously, if I can overcome separation anxiety and bad naps to pull this recipe together, you can totally make them too!